You may know them as those bright stickers on appliances with stars on them, but energy star ratings are much more than that. Most people don’t know it, but when you’re shopping around for a new fridge or washing machine, paying attention to these little labels could save you hundreds (if not thousands) of dollars. Don’t always be fooled by fancy bells and whistles or expensive brand names. While getting the best looking appliance is nice, it’s not the full story. The other thing you need to consider in your purchase is how much it is going to cost when you take it home from the store. How can you tell how much fridge A will cost to run versus fridge B? With energy star ratings. The energy star system is government standard that was created to help consumers make more informed decisions about the appliances they choose to buy. Energy stars show the energy efficiency of an appliance, and can be found on electrical items across Australia and New Zealand. It is a symbol you can trust to tell you at a glance how much energy an appliance will use (among other things) compared to similar options. They make it easy to understand fast the facts about electricity consumption of the fridge you’re thinking of buying, versus another you are comparing from a different brand. 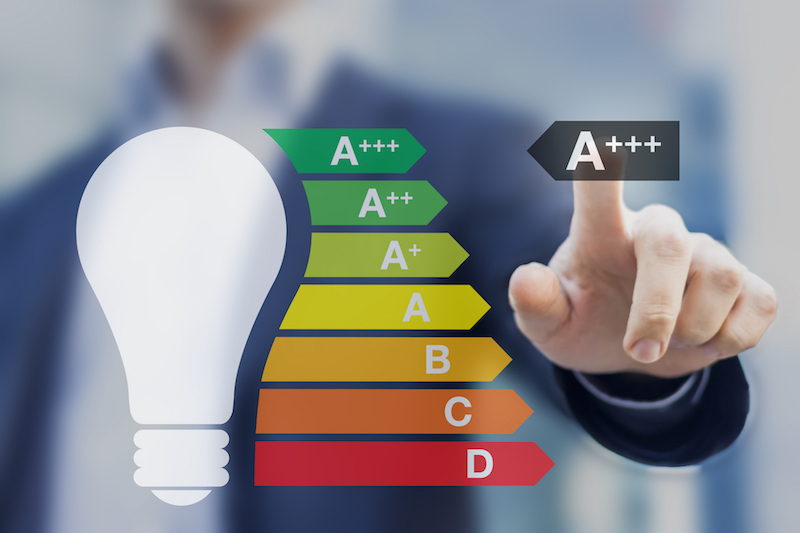 In other words, energy ratings can tell you exactly how much money you will save on running costs after you take your appliance home. This might not seem like much at first, but for large items like a fridge which you could run for several years, it could be hundreds of dollars. What Do the Stars in the Rating Mean? Appliances that have the energy star labels on them are very easy to spot – The stickers are a bright red and yellow colour, with a crest of stars across the top. These stars represent the energy rating of the electrical item. There are two energy rating systems in Australia: a standard 6-star rating, and a 10-star rating. The 10-star is a label found on appliances that have been verified as highly efficient. The energy rating itself is very simple. The more stars that are filled in, the more efficient the appliance is and therefore more money you’ll save to run it. Lower down on the label you will find an orange number. This is the overall energy amount that the appliance consumes per year. It gives you an even more accurate reading you can use to compare one electrical item with another in-store – the lower the number, the better! The great thing about energy ratings is they allow you to compare items quickly, even if you’re considering different sizes or capacities. Best of all, you can use the numbers to calculate the running costs for your new appliance on the spot. The energy stars give you enough information to discover how much an appliance will cost you to run per year, on average, right there on the spot. To do this, simply take the number in the energy consumption box on the label, and divide it by 4. If the number on a fridge is 500 kWh per year, that would equal 125. That fridge would cost you around $125 per year to run at home. Simple. These numbers aren’t pinpoint accurate, of course. Most Australian energy rates are around 20c to 30c per kWh, so this example splits the middle at 25c (and makes it easier to figure out). It’s a great rough estimate of which appliance will serve your wallet better, particularly when it comes to large items like whitegoods. Is There a Minimum Star Rating You Should Buy? Energy stars are a guide only, and for that reason if there is no star rating you should look to avoid buying the product completely. It is completely ok to buy a model with 1 or 2 stars. In many cases, these will be cheaper options which could be more cost effective for your home or office at the time. If an appliance has an energy star rating sticker at all, it means the item has passed Australia and New Zealand’s strict energy efficiency standards. So if the label is there, the appliance is safe to use and will provide a good output for the energy it uses. Having said that, it’s always best to go for higher star ratings if you can. Appliances over 3-4 stars are a good benchmark to aim for. When you’re shopping for larger items that you know will last you a long time, it might be best to pay more upfront. The benefits will come to you in the form of much cheaper electricity bills year after year. It will be a gift that keeps on giving – provided you check out the energy star rating before you get it. For more information, take a look at our Guide to Energy Efficient Appliances.